For spring break this year my mom and I traveled to Punta Cana, Dominican Republic to visit our newly relocated family. This was the first time I had been to this part of the island for an extended period of time, as my family were previously all living in the capital, Santo Domingo. 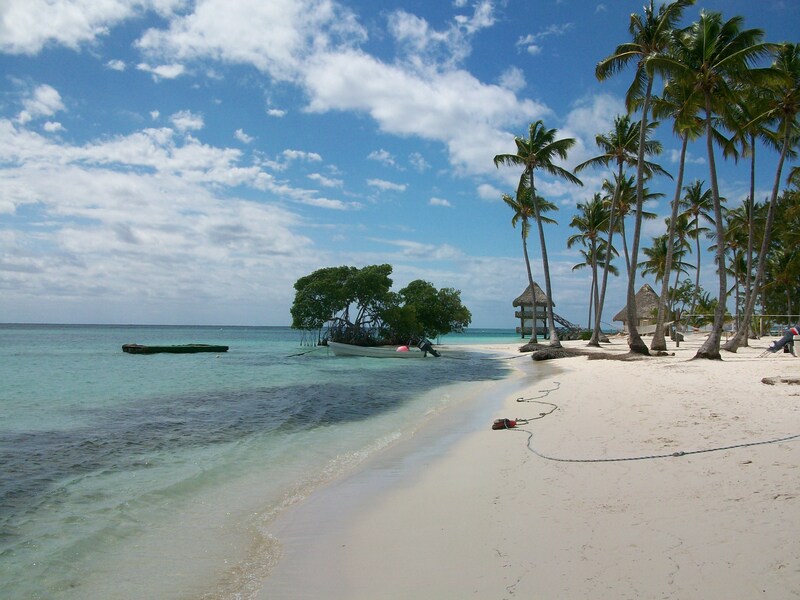 Punta Cana is located on the easternmost tip of the island, has one of the longest stretches of white sand beaches in the Caribbean, and might be one of the most beautiful places I have ever experienced. My mom and I arrived late Sunday night on a plane filled with spring breakers who spent the entire flight enjoying the duty-free liquors they purchased in the airport terminal. Waiting for us on the other side of customs were my aunt, grandparents, and 3 oldest cousins. They held signs and screamed as we turned the corner, much to the amusement of the intoxicated college students behind us and not at all to the amusement of the security guards physically holding them back. Though some people might have found this embarrassing or unnecessary, I didn’t expect anything less. My family is crazy, they wouldn’t be complete without their eccentricities. And I wouldn’t have it any other way. We were quickly whisked away to be shown my Aunt’s new house, which was only a few minutes from the airport and absolutely beautiful, and after being fed the first of many enormous meals, we were finally shuttled over to our hotel, where we fell into happy sleep. 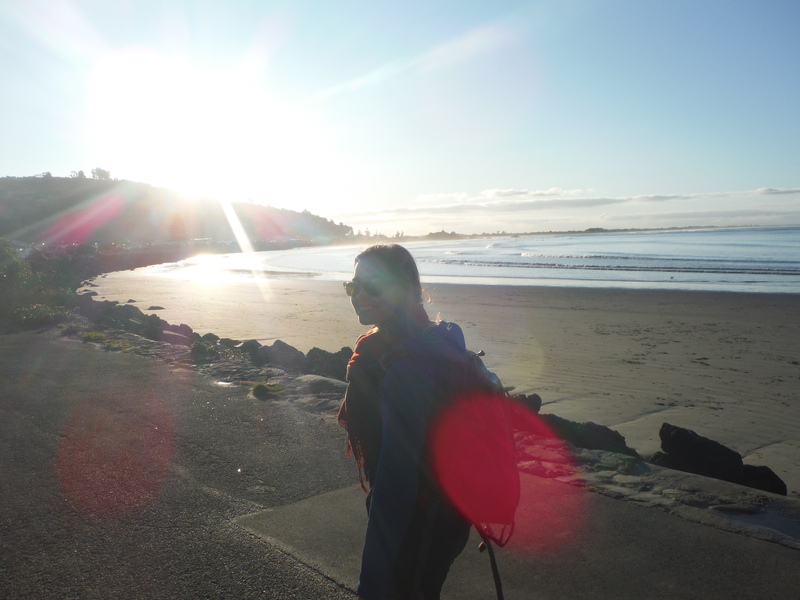 It had been almost a year since I had seen a proper beach, so I was eager to get my tan on the next morning. The beach at our hotel was amazing, and after breakfast overlooking the ocean, my mom and I set out to find some chairs and enjoy the sun. My skin was almost green it was so pale, and there was nothing I wanted more than a tan. But as it turns out I was too greedy and ended up with the worst sunburn of my life on that very first day. I was red as a tomato and in so much pain I wasn’t sleeping at night, and all of the planned activities for the next 2 days had to be canceled because my burns were so bad I could barely move, much less go kite surfing or swimming. Talk about a bummer. Oh well, like the Dominicans say – todos son negritos en la noche – everyone is black in the night, so it doesn’t matter how burnt you are. Dominicans are many things, but politically correct is not one of them. So instead of the adventures originally planned, we spent the next two days exploring the area. My Aunt is a real estate agent and took us to see quite a few amazing pieces of land in Capcana and Corales – two high-end areas under development. The biggest difference between this region and the capital is how touristy it is. There are pros and cons to this. In Santo Domingo the poverty is inescapable, the traffic is suffocating, and there is always someone knocking on your car window for money. Like any urban area it is dirty and crowded, has it’s good and not-so-go neighborhoods, and the occasional street fight has been known to break out. But in those crowded streets is life and character and culture. Driving down the perfectly manicured lawns in Punta Cana, on almost empty, recently paved roads, I felt that I could have been anywhere. The essence of the country, the flavor of the Dominican spirit, wasn’t there. This made me sad. After the sunburn became a bit more manageable, my grandma (who we call ‘Ita’ – short for abuelita), mom and I spent a morning exploring one of the island’s best kept secrets – the lagoons. 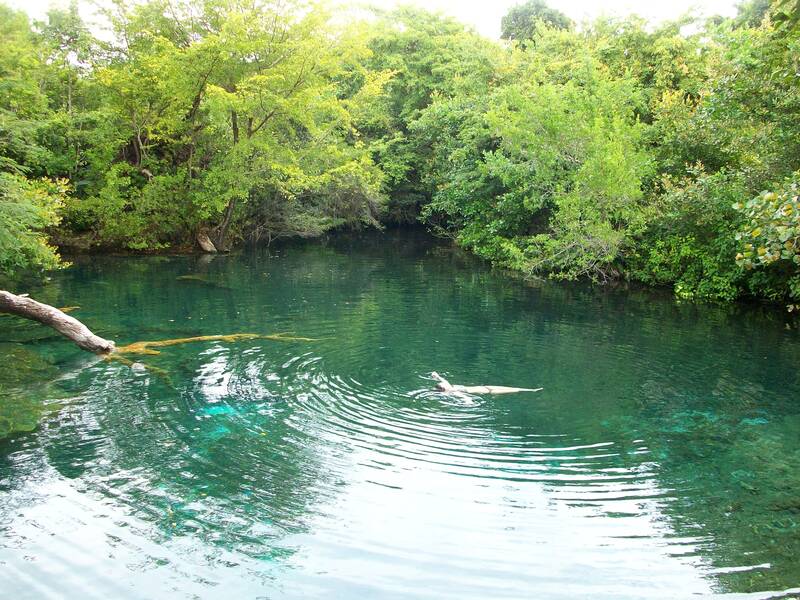 There are fresh water springs scattered all over the island, and a cluster of 8 or 9 right on our hotel’s grounds. This was one of my favorite days. The lagoons remind me a lot of home and my Weeki Wachee river. They are fresh, cool, and calm – a beautiful contradiction to the salty wild sea. And best of all – not a tourist in sight. On Thursday Ita took my mom and I to Bavaro, a popular beach slightly north of Punta Cana. We went to a restaurant called El Pulpo Cojo – ‘The Lame Octopus.’ It was right on the beach, and as long as you plan on eating at some point you are free to take over a lounge chair for the day. It’s a good deal and a great way to see the beach at Bavaro without staying in one of the hotels – and there are a lot of them. This is where many of the all-inclusive resorts this area is known for are located, and the beach was crowded with people of all shapes and sizes and walks of life. There were spring breakers and families and large Europeans in small bathing suits – all enjoying the sun, the sand, and the waterside aerobics classes. It was definitely a site to see. One thing I will say for the Dominicans, something my mom pointed out to me, is that although they have definitely embraced the tourist industry with open arms and little ecological concern, they have managed to stay away from the high-rise lined beaches popular in the States. So even though hotels line the beach at Bavaro as far as the eye can see, you can also still see the stars at night. On our way back from Bavaro we drove through the country and I was happy to see that outside of the resorts the life I had been missing was still very much intact. Ita had been raving about a fruit stand in town that she claimed was the best and most beautiful she had ever seen. So we drove 30 minutes out of our way to find it. All of the fruit stands in these towns are colorfully painted and beautiful, but Frutera Felix was definitely a work of art. 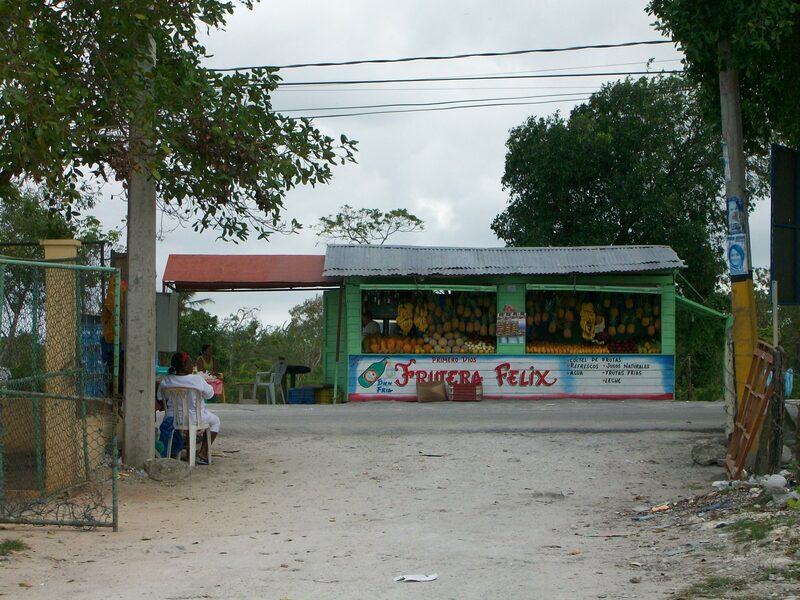 When we pulled up we were greeted by Felix himself, who took more pride in his fruit stand than any American CEO I’ve seen. He gave us a deal on a bag of mangoes as long as we promised to come back to try his famous fruit salad. Although I didn’t have time for it on this trip, there is no doubt in my mind that I will one day return to try Felix’s salad. I wish they had stands like this in the States. On my last day in the DR we drove an hour to an isolated beach called Macao. I know I’ve been calling things ‘the most beautiful this’ and ‘the most beautiful that’ throughout this entire post, but this was really the most beautiful beach I had ever been to. It was truly wild, complete with big waves, unmanicured shoreline, and large rocks. But the water was crystal turquoise, the sand made of fine yellow and pink pebbles, and best of all – we practically had the place to ourselves. They were running a tourist operation on one end of the beach, where they were bringing people in on excursions from the resorts and cruise ships, and on the other side was a small surf class, but most of the long stretch of beach was ours. And then it was time to go. I arrived at the airport with mixed emotions. I’d be lying if I said I was anything but exhausted by my family. I was also eager for social interaction with people my own age, as I had spent the entire trip with either my younger cousins or my older aunt, uncle and grandparents. I felt refreshed and ready to get back to this last semester of school. I missed my friends. But I also wanted to stay. And not just for the sun and the surf and the sand. Every time I come and go from this place I am left with a feeling that I haven’t been able to figure out. I enjoy such a strong connection to the people and to this country. And yet, sometimes I think there can’t possibly be anything there at all. That I’m just another silly tourist, an outsider looking on, someone who can never really be a part of it. I understand it all, I know it all, but how can I be a part of it all as someone who comes and goes for only a few weeks at a time, often with years between visits? It’s a panicky feeling, as I get on the plane, that the entire trip was one long game of pretend. That there’s still something missing that’s keeping me from properly claiming the rights my bloodline give me. That I shouldn’t leave yet. That I should stay and figure it all out. But of course, I have to go. I guess you can call it an identity crisis. I don’t necessarily think its a bad thing. In fact, I think these are the thoughts that originally sparked my interest in travel and other cultures. But I think because of my recent Peace Corps assignment this trip has left the questions burning deeper than previous trips. It scares me a bit more this time around, because I can’t stop wondering, among a million other things – how can I immerse myself in and truly understand a completely foreign culture when I can barely grasp my own?